What is it about cinema that make this medium so susceptible to reverential paeans to itself? What is it about celluloid spools, magnetic tapes, LaserDiscs, or the hyaline crispness of contemporary digital image that is able to continually hypnotize and afflict generations after generations with a deeply dysfunctional affection known as cinephilia? For many, the sparest of means — sun-splashed image from a projector radiating in a dark room — a first encounter, and unlikely the last, can hold sway a lifetime of cinephilic obsession akin to the very seismic, flattening, and all-conquering effect of a first love. The 2nd year of SeaShorts film festival begins brightly by turning obsessive reflection from subject to project. Taking place in the timeworn townscape of Georgetown, Penang, heritage spaces with its chaotic ramshackle appeal captivate the city for five days by playing host to a festival dedicated to showcasing the best of Southeast Asian short films. Perhaps ever-appropriately, the opening program, titled “My Student Film”, takes to task the physiological, if not metaphysical, preoccupation of Southeast Asian filmmakers. Through laborious curatorial work involving the collective effort of the entire region, 7 film school theses of well-established filmmakers the likes of Garin Nugroho, Aditya Assarat, Dain Said, and Anthony Chen are given a new lease of life, some revived from their moldy VHS tapes by Asian Film Archive. It’s a program that retreats into the past, but it’s not strictly nostalgic. The very tracery of such a series chronicles and contextualizes the developing sensibilities of these directors when they were young, discovering not the unraveling of mysteries and dramas of their new works, but their very genesis. There are many outstanding films in the program, two of which concern cinema, one more spiritually while the other more explicitly. Garin Nugroho’s Gerbong 1, 2, 3, falls into the former category. Set in and around the railway stations in Indonesia, 2 men and a woman converse about illusion and reality, independence and American presence, life and death, and cinema and meaning. For a student work, Nugroho exhibits the very measure of a deft auteur-in-the-making, weaving intricate formalistic play with photoroman flourishes that wouldn't seem out of place in a Godardian work. But what is more impressive in Gerbong is the trigger of an archaeological element of cinema going back to the 19th century. One of the earliest forward-moving shots in the history of cinema — Passage d’un tunnel en chemin de fer pris de l’avant de la locomotive — essentially a unidirectional shot taken from a moving locomotive train gliding across the tracks heading towards the Gare de Saint-Clair, filmed by the Lumière brothers in Lyon in 1898, is astonishingly revived again in Indonesia after close to a century. If nothing more than a metafilmic nod, Nugroho evokes this historical lineage with the line “Still remember the moments before the last train wagon went by?” If this further concretizes Lumières as a spiritual progenitor to Gerbong, Nugroho flatly challenges it in the next shot. At one point in the film, Nugroho slow-cranks the camera mounted on the train in an unbroken 360-degree turn, upending visually and historically any canonical overdetermination attempted on the film, leaving the young Indonesian man suspended in the skies as he runs after the train. Nugroho’s usage of slow-advancing train shots are also more sophisticated than what was available in the past. Narrative voiceover infiltrates tracking train shots, the tone constantly hovering in between fogs of illusion and reality, infusing the short with an opiate-like quality that perhaps Nugroho wants the cinema of Indonesia to break away from, hinting at some point the pervasive influence of American politics and media in the local landscape, evidenced when he intermixes local ink sketches with a photomontage of Ronald Reagan in competing sequences. In the case of Anthony Chen’s G-23, the quintessence of youthful filmmaking’s sheer exaltation is at its full flourish. Falling into the latter category of more explicit cinephilic evocations, G-23 exhibits a young filmmaker’s enthusiastic exuberance for the medium. Made when Anthony was just 19, the short chronicles the story of three idiosyncratic city dwellers: a young Indian girl, an elderly man, and a middle-aged lady from the perspective of a lone ticket usher. It’s an array of social misfits who might very well wander into Tsai Ming Liang’s filmmography, particularly that of Goodbye, Dragon Inn. While Anthony’s various cinematic gestures aren’t coy in its awareness — the middle-aged lady is one detail away from doing a full Brigette Lin in Wong Kar Wai’s Chungking Express, contemplating over a lychee can instead of a pineapple can — the film, despite its effusive homage, remains central to the very pressure-cooker environment that typifies the megalopolis, interweaving the phenomenon of urbanite disaffection into a morosely funny Singaporean tale. These films represent touchstones in Southeast Asian film history. Anthony Chen would go on to make Ilo Ilo, and Garin Nugroho Opera Jawa. In that essence this series exhibits the nascent talent of the region already in the making. Not once do these works succumb to the temptation of vacuous pastiche, or worse, awed mimicry out of complete deference. Instead, there’s enough social and historical import palpable in the films in and of itself. With the sparest of means, the SeaShorts film festival has organized a program that captures the cinematic grace of the region, giving form to a collective dream where a dark light in an empty hall can create an international, intergenerational, intertextual, and intraregional echo chamber of cinema and longing in Southeast Asia. Wei Jie Lim is a freelance filmmaker, screenwriter, programmer, writer, and photographer based in Malaysia and Southeast Asia. He is a graduate of the Tisch School of Arts, NYU with a double major in Film/TV Production and Philosophy. A Year and It's Cycle Opens to Something New. A year just completed its cycle in the blink of an eye and here I am, standing in front of the audience crowd, announcing our failed Indiegogo campaign for SeaShorts Film Festival 2018. 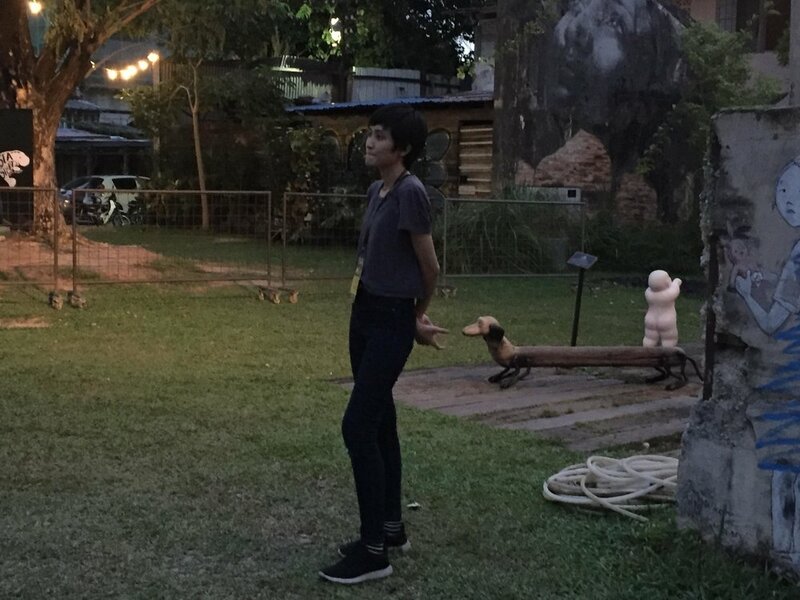 Thanks Rou Ning for this indistinct photo. Despite this fact, we still make the festival real, just with additional starvations added to our daily diet since the core team members have been working for nearly six months for a month's pay. It's okay. We would always convince ourselves saying that everything's okay. We are learning and gaining experiences. We are friends, we have to starve together. That sounds more moving. But to be honest, life is really not easy when you had to think twice before ordering a roti canai. Looking back at all the preparations we've done throughout the past months, I'm both shocked and overwhelmed. We've been paying ourselves with our efforts, sweats, and tears. Family don't really understand why we are organizing a film festival without pay; some friends couldn't see why we worked our asses off for such an 'insignificant' festival. But really, we swallowed all that and kept moving forward. Today, the core team members stood in front of the invited guests, still feeling motivated even though exhausted while smelling a scent of freshness from the audience crowd. Each and every audience's look of excitement, a smile, or even an applause sufficed all the hard work. Zai Kuning and Darrel Chia are enjoying the view of a dugong tree. SeaShorts 2018 had officially started on the 1st of August at 20:00 in conjunction and in partnership with George Town Festival. We are honored to have Amir Muhammad as our emcee for opening ceremony (as usual). As usual, he made jokes. Jokes that would make you laugh whether they were funny or not. Mr. Horikawa Koichi from our sponsor Japan Foundation Asia Center is giving his opening speech. The opening ceremony proceeded with the screening of Chloe's Confession of A Programmer–a 20-minute film that comprises a series of interviews with some SeaShorts 2018 film programmers, including Jacky Yeap (Malaysia), Gertjan Zuilhof (The Netherlands), Thomas Barker (Australia), Leong Pui Yee (Singapore), Sanchai Chotirosseranee (Thailand), and Koyo Yamashita (Japan). Chloe is watching her audience watching her film. With the abstract music composed by Syukri, the film looks a little bit like an interrogation of CSI or any of that sort but a more friendly and intimate kind. One of the most amusing questions I found in this film was 'What if there's no cinema?' and while answering, Pui Yee laughed. While many lights have been shed on filmmakers, Chloe brought the less rewarding programmers to the big screen where they revealed and laughed at their dark secrets. Liew Seng Tat is talking about his student film Don't Play Play. Jacky's programme 'My Student Film' served as the opening films. The programme featured the works of the now-established filmmakers' student works, dated decades back, including the works of Dain Said, Anthony Chen, Garin Nugroho, Sherad Anthony Sanchez, Edwin, Aditya Assarat, and Liew Seng Tat. The films were old but managed to survive the test of time. To Seng Tat's request, an audience gave him a cigarette. 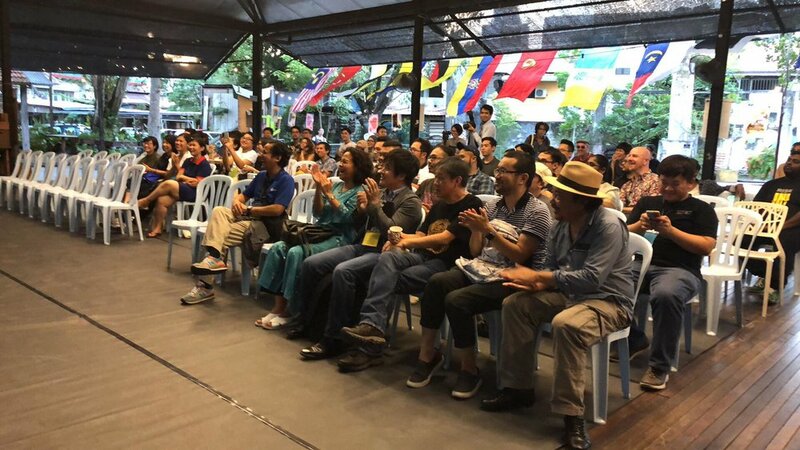 Seng Tat, who was reddened by few cups of red wine, lightened a cigarette while answering questions from the floor. 'Return of Salt Boy 1' was an exquisite curation programmed by Gertjan Zuilhof to emphasize on the indigenous communities in Southeast Asia. The programme had much to say about the forgotten people and people who disappeared with unjustified reason. Pimpaka's The Purple Kingdom was one of these films. Q&A session of 'Return of Salt Boy 1'. The screening ended after 00:00 and the audiences were still actively posing questions at Pimpaka. The film wasn't just about a wife seeking for the truth of her husband's death but also about the director's careful observation of this specific group of native that opened up another scope of view for films to blend in documentary and fiction with personal and genuine human connection between the outsider (the filmmakers) and the insider (the subjects). Keenen carries the easel back to hotel. The street was empty and the moon shone brightly by the time when the screening ended. We walked 24 minutes back to hotel while carrying an easel (for set up and deco purposes). Penang was lovely at night. The sound of TVs could still be heard outside of these old buildings. I peeked into the window of an old house and saw an old man watching a TV. And me, as an outsider, got to catch a glimpse of his life. In his program Return of the Salt Boy, Programmer Gertjan Zuilhof had programed Zai Ruda Kuning's Riau, a 30 minutes documentary on the Orang Laut (Sea Gypsies) in the Riau Archipelago, part of Zai Kuning’s long-term research. We had heard a lot about the legendary Zai Kuning, and really excited to hear that he is coming to SeaShorts. And he wrote to us, "I am now become more relax after the big show recently down and waiting getting ready for Japan in october. just this 2 days i am made aware of the festival you guys put together via email and Fb. i am excited and have block up my date to be there a week for a kind of holiday treat for me. Here i have some thought and probably proposal. Since past 3 month beside the big sculpture i do edit and rework or extend the film RIAU to a 70Min video/film. edit for live music. it is an extension of my work of 17 years journey. I did the screening and live music performance. So i am wondering if the organiser will be interested to screen this film with me playing the music and be good to have 1 malaysian musician i know Kamal Sabran....."
And now we want to announce to you that we are going to have this music performance by Zai Kuning and Kamal Sabran in #SeaShorts2018. More shall be revealed soon! Over the past 18 years, Zai Kuning's fascination with the forgotten and misunderstood history of the Malay world has brought him onto a journey that stretches across the maritime realm of Sumatra, Riau Archipelago, up to the Andaman Sea. Chronicles of Amnesia is a documentation of his search for the enigmatic orang laut (sea people), encounters with a troupe struggling to sustain the tradition of ancient Malay opera Mak Yong, and discovery of the forgotten king, Dapunta Hyang Srijayanasa from the 7th-century Srivijayan empire. Chronicles of Amnesia is currently shown as a work in progress, as the artist continues to explores its music composition over the next 2 years. Some filmmakers are crazy . That's common. But not many are as crazy as Khavn De La Cruz. Some programmers are wild, that is unusual, but it happens. But still none quite as notorious as Gertjan Zuilhof. Some filmmakers make a new film especially for a program, that's common when there is a commission and funding. But it is quite special when a filmmake make a new film for a programmer, for a very small festival, without commision. It happens when you have some crazy people working together. So now we will have World Premiere of this very special film. It is world premiere because Khavn just made it, and maybe still making it. Come and watch it at #Seashorts2018, Aug 1-5, George Town. Three years before George Melies' "Le Voyage dans la Lune" and ten years before Segundo de Chomon's "Excursion En La Luna", indigenous proto-surrealist Philippine filmmaker Narding Salome Exelsio made "Nagtungo si Juan Tamad sa Buwan" in 1898 while the Philippines was being sold by Spain to American for twenty million dollars (VAT not included). Khavn is the great great grandson of Narding Salome Exelsio (1883-1949). He is currently the president of the Southeast Asian Institute of Pataphysics (SEAIP) and the founder of the Museum of Incoherent Cinematography (MIC). It was not easy to curate a program like this. And it was a great idea from Jacky Yeap. He worked very hard to get all these short films. "I actually talked to a friend not long ago wishing to see a festival that features student works of filmmakers. " Apitchapong replied to our invitation. He was very happy to hear about this program, and offered his short film. It was unfortunate that our screening facilities cannot show DCP, and we do not have funding to solve this problem. And we heard from Lav Diaz that he did three shorts when he was at the Mowelfund Film Institute, where he attended a film workshop. Only one survived ( he think they still have a copy of it). The other two, he lost them. We are still trying very hard to contact Mowelfund Film Institute. And It took us sometime to get this mouldy beta tape from Dain Said, and with sponsorship of the Asian Film Archive in Singapore, we managed to get a digital copy. So, please grab this opportunity to watch this first time ever, a collection of student short films by the young Dain Said, Garin Nugroho Riyanto, Aditya Assarat, Liew Seng Tat, Edwin Blindpig, and many others! A few months back, I found this small book on Yin Shao Loong's bookshelf called "Surabaya Johny". I only it knew as songtitle. And I didn't know Dain Said wrote a book in the same title. And things became even more interesting when i found out it is actually about this film he did, both a mockumentary and film noir. I wanted to show it in our film club. I asked Dain. He was surprised how I knew about this film. And then he promised to look for the copy. "I am trying to locate and see wether there is more than just a film copy ( 16mm) or if I have a ( I know this is ridiculous) a tape copy, either Beta Tape or 1 inch tape....much of my film and negs have either been mouldy or melted in this tropical heat..... but should I do have it the I will let you know...I know that I have a vhs copy somewhere. " Yin Shao Loong said he has a VHS copy of it in his parent's place, where he took from KOMAS. but he could not find it anymore. He suspected his mom had threw it because it was full of fungus. This is a tropical problem. The humidity is really not good for film archive. When Jacky Yeap decided to make his "My Student Films" program for #SeaShorts2018, this short film seems so fitting. And Dain, in the midst of moving house, finally located his copy. "Can we meet up n talk, cos I need to correct a mistake in the spoken narrative, ....which then affects the voice cos my voice is a lot older, I have found the beta copy last week as we r moving n I am packing n found the beta tape version with a little mold on the sides." This is the beta tape we got. And we took this photo, to show the condition of the tape for the kind people in Asian Film Archive, to see if it is still possible to transfer or digitize it. They were very doubtful, but asked us to courier the tape anyway. We took this photo to email to Asian Film Archive to see if it is even worthwhile to courier them the digital beta tape. Look at the mold!!!! And after a few weeks, we received their email saying the copy is done. I still had not seen the film myself, because I want to keep the experience of watching it on big screen during SeaShorts. And I like this photo of the moldy tape so much, because it said something about us the tropical filmmakers: the humidity, the heat, and living for the moment, and really not care too much about immortality, hehe. Luckily we have Singaporean who will think ahead and actually archive films for us. Jacky, the programmer of the programme My Student Film, spoke to the five established filmmakers to ask what they recalled when they were making their student films. At that time students did not have enough money to buy 8mm raw materials, so we bought the cheap material illegally from someone who worked at National TV station. Shooting on a train was also without permission, we did it stealthily. Chui Mui: 'I See. Maybe I remember wrongly. I started film school really early. 17 in fact. I shot 'G-23' when I was 19 as part of my graduation film at Ngee Ann Polytechnic's School of Film and Media Studies. We shot it on 16mm. I really do miss shooting on film. At that time, there wasn't even video assist available at the school. So there was no video monitor to look at what one was shooting and no way of playing back takes. It was pure trust and instinct of what you are capturing right before your eyes. I almost feel some of that discipline gets thrown out the window with the digitalisation of the medium. Now we get so used to watching 'playback' so much. I had a tutor who hated me and I think he was responsible for this event; I went out for coffee, and when I came back at the premiere my friends told me that a group of dark-suited Indonesian men in a black Mercedes, came out and started shouting and haranguing the screen where the trailer of 'Surabaya Johnny' was playing. A few years ago when the 'Act Of Killing' was made his name was in the credits as one of the producers. It is often believed that short film is a gateway to the feature film, an idea, or a presentation of the form. Like a prototype. Shorter version of the longer form... Cinema, but bite-sized...? That can be true. But to some filmmakers, they can be something else entirely; they are a form for expression and experimentation. The short film, perhaps, can be imagined as a malleable form that can easily be broken, molded or bent. A shapeshifting form, that can shapeshift into different objects. We believe that the existence of SEASHORTS offers a platform to showcase the results of the filmmakers’ different methods of play. 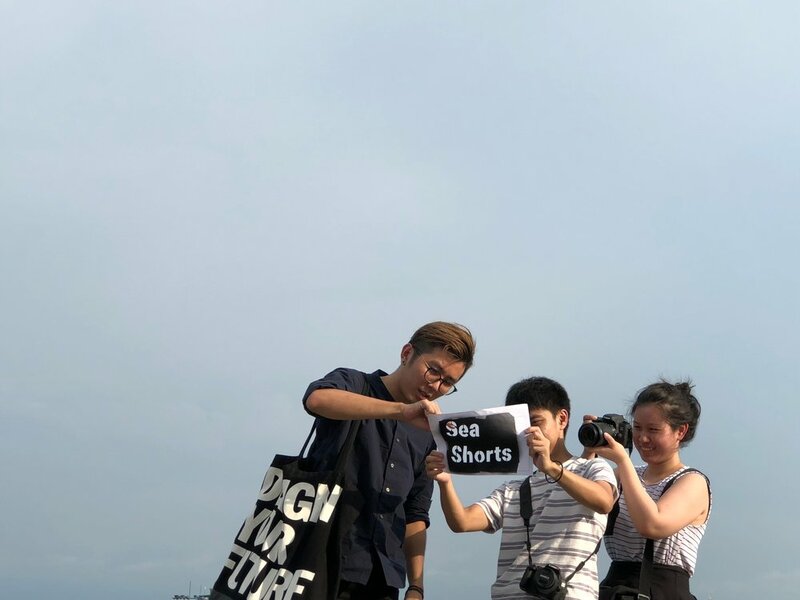 KUALA LUMPUR, Malaysia - Next New Wave announces its second annual SeaShorts film festival to be held from August 1st to 5th in partnership with George Town Festival, Penang. During the 5 days of the festival, there will be a screening of special programs, notably S-Express, an annual collaboration of short film programs from 8 participating countries (Thailand, Singapore, Indonesia, Myanmar, Cambodia, Malaysia, Philippines, Vietnam) and is an insight to the developments of filmmaking in the region. SeaShorts will also feature short films by Southeast Asian filmmakers such as Garin Nugroho, Riri Riza, Liew Seng Tat, Edwin, Pimpaka Towira, and Zai Kuning. Last year, the festival screened 118 short films from 10 Southeast Asian countries, with audiences mainly consisting of film curators and filmmakers. The films are from Philippines, Thailand, Indonesia, Singapore, Cambodia, Myanmar, Vietnam, Brunei, Laos and Malaysia. Film screening during SeaShorts. The audience was mainly international curators and filmmakers. SeaShorts is small but international. The festival guests came from Singapore, Thailand, Indonesia, Vietnam, Myanmar, Brunei and Japan. Yuni Hadi shared her experience as festival director of Singapore International Film Festival. A panel with film festival directors from different Southeast Asian countries: from left to right, Thaidi from Wathann Film Festival Myanmar, Yuni Hadi, Amir Muhammad the moderator, Fransiska Prihadi from Minikino Film Festival Bali, Calida from Thai Short Film and Video Film Festival. Panel with the jury members of the Next New Wave Competition, Shanjhey Kumar Perumal, Sharifah Amani and Aditya Assarat, moderated by Umapagan. The festival is currently calling for submission of short films from all Southeast Asian countries. 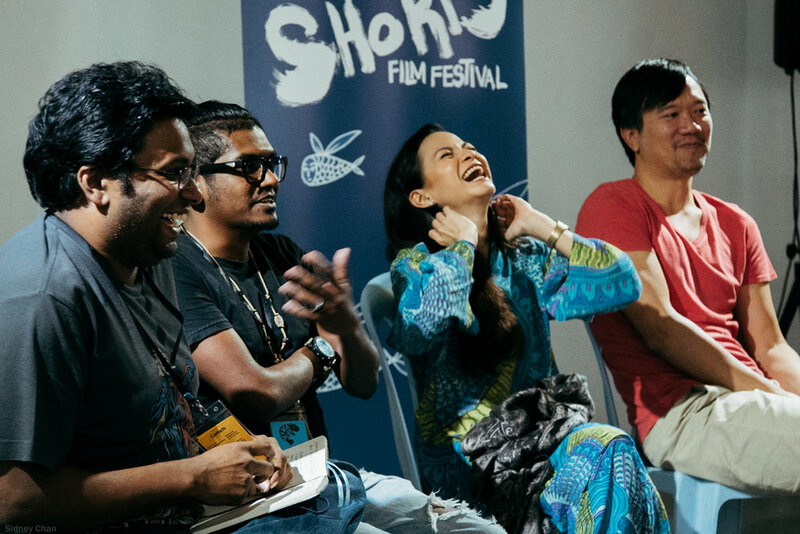 20 Southeast Asian short film entries will be selected by notable film curators for the SeaShorts Competition, and 10 Malaysian short film entries will be selected for Next New Wave Competition. The Juries of SeaShorts will be announced in April. SeaShorts started calling for submission on February 5th. In one month, we received 79 submissions. We are very happy to receive 26 submissions from Philippines! We are urging filmmakers from Laos and Myanmar to send us more films. Submit your short film to us! Deadline: 3rd June 2018 (before 23:59 UTC/GMT). -Director(s) must be from Southeast Asia. -The short film submitted has not been premiered in any film festival before 1st June 2017. -The submission should be done by owner of the short film. -All submissions must not breach any third party copy right (i.e. if you use commercial video, music or stills, please clear the copy right before submitting). What does a short film resemble? A knife, a letter, a window, a song? Then what does a short film from Southeast Asia resemble? A rusted parang knife? A letter from home stained with tears? A shutter window that doesn't close well? A soft and slimy love song with heavy nasal tones? August 1st to 5th, SeaShorts will be showing more than 100 short films in George Town. Come and feel the bright and humid stories that feel so familiar to us yet so foreign at the same time. Prior to SeaShorts, there will be a series of screenings in George Town. Our journey for creating ‘The Tiger of 142B’ started when we were approached by David Lee and Eternality Tan (ET). They were looking for animation directors to do animation adaptations on Singapore literature for Utter Singapore 2015, a festival commissioned by Singapore Writers Festival. There was a list of literature books we can pick from. We read a few and could not connect with the pieces. Tan Wei Keong, who is also an animation director, recommended us to read ‘The Tiger of 142B’, a short story taken from Dave Chua’s ‘The Beating and Other Stories’. He had told us that Dave Chua had wrote a story about a tiger roaming around a public housing flat, and we immediately became interested in it. Original story adapted from Dave Chua "The Tiger of 142B"
While we were attracted to the surrealistic elements of the story, what really appeal to us was how we could relate to the protagonist's struggle. When we first graduated, we were in a similar situation as the protagonist. We had to choose between getting a job that offers a stable income or to continue pursue our passion as animation filmmakers. Coincidentally, when we were struggling with our decision, we bumped into Dave Chua at a book signing event, and he advised us to “keep animating”. After we decided that ‘The Tiger of 142B’ is the one we will go with, David and ET arranged a meetup with Dave Chua. We were very nervous at first because Dave Chua is a well-known writer in Singapore and we were worried if we might make a film that misrepresent the original intention he had for the short story. So when we met him, we immediately asked what the tiger in his story represent. He candidly said that he had forgotten what the “tiger” was about. We all laughed when he said that, but we knew that it was his way of giving us the liberty to adapt his story in anyway we want and shaped the overall message we wish to convey in the adapted version. We cherry-picked parts of the story that we felt strongly for and started working on the film. Doing the adaptation from text to screen also meant giving a face and adding colours to Dave Chua’s ‘The Tiger of 142B’. While we are big fans of Japanese animation and European animation, we were determine not to imitate their style. Instead, we wanted to create a style that has a fusion of both. For example, the big squarish eyes design is inspired from Japanese anime. And because the protagonist is sort of disillusional, the background art was intentionally kept flat with somewhat distorted perspective. We drew inspiration from french animators Jean-Loup Felicioli and Alain Gagnol, the creators for ‘Le Couloir’ and ‘A Cat in Paris’. In addition, to show that the ‘tiger’ is always present, we added furs (short dashed lines) all over the characters and the background arts, and in scenes where the protagonist’s becomes more emotional, the ‘camera’ is placed in ways that utilize visual elements to resembles the Tiger’s stripes. The entire art exploration took us around 2 months. Drafting out the story also took us some time. Our original intention was to not do any storyboards like what we did for our first animated short film ‘Contained’. But because we were working on a larger scale and had to show updates to David and ET, and National Art Council (NAC), we had to straddle between the usual pipeline production approach and the experimental approach. So instead of writing a script first, we storyboarded the whole film and had it piece them together into an animatic. Only after we feel comfortable with the animatic, we then work on a proper script for NAC to review. However, even then, we were mindful to not get stuck in the storyboards we did. We constantly made changes to the film. We keep adding shots and removing shots even towards the very end of the production. There were quite a few portions where we already had them colored but had to be removed because it did not fit. The ending of the film also went through changes at the very last two weeks of the production. In all, while the original story was written by Dave Chua, the whole process of adapting his story felt like we were making a very personal film of our life. Even till today when we watch ‘The Tiger Of 142B’, we could still feel that the character in the story resembles a mini chapter of our life. We are really thankful for Dave Chua to write the story and most of all, we are thankful that Dave Chua, David Lee and ET gave us the freedom to adapt the story in anyway we want. Memantau Along The One Way dari jauh itu rasanya harap-harap cemas. Sempat saya titip salam lewat Eden Junjung untuk mbak Tan Chui Mui dan festivalnya yang keren. Terimakasih untuk teman saya di Malaysia, Bebbra Mailin yang posting di fesbuk ada foto ibu bersama Alma, cucu pertamanya di katalog Sea Short Film Festival. Saya beruntung dibantu semua anggota keluarga. Ketika syuting, ibu saya sering berkata "yo, besok kalo mama udah meninggal, filem ini bisa jadi tinggalan mama ya le. " Ibu saya juga antusias mengikuti perkembangan pemutaran film ini. Bapak saya dalam suasana panas politik indonesia ini sering juga bertanya "kamu ada di barisan mana? Kamu ada di pihak mana?" beruntung juga saya kenal pembuatan film, jadi saya jawab dengan "aku di barisan orang-orang yang merekam peristiwa pake kamera." Dialog-dialog seperti ini dalam rumah saya yang menjadi motivasi besar membuat along the one way. Dan ketika film ini jadi, saya berterimakasih pada sea short film festival telah membuat film ini punya cerita lanjutannya untuk dibawa pulang ke rumah. Terimakasih juga untuk teman-teman yang ada pada credit title film ini : yogi king, zen al ansory, lintang aulia, fauzan abusalam, jeihan angga, baskoro prasetyo. Teman-teman dan keluarga adalah modal utama. A young unemployed man finds himself having difficulty in communicating with his girlfriend. As he struggles to cope with his fragile state of mind, a series of mysterious killings unsettles the residents of Block 142B. Director: Harry and his twins brother, Henry Zhuang, co-founded their own company Weaving Clouds, a small studio dedicated to producing animation that explore creative storytelling. They have both worked closely together on both 2D and stop-motion animation short films, always searching ways to tailor make animation to suit the story. Both brothers are also Media Education Scholarship (MES) recipient. One day my mother asked me to go home. Once I got there, she asked everybody in our family to choose a governor whose religion is Islam. I refused because I disagree with her logic. But mother kept on telling me to choose one based on religion. Director: Bani Nasution was born in Surakarta, Central Java Indonesia as the last 80’s generation. He was finished study as bachelor of art from Surakarta Institute of Art film & tv faculty. His films was screened in Fest Film Solo 2012, Ganesha Film Festival Bandung 2012, Jogja NETPAC Asian Film Festival 2013. His latest work, Along The One Way was finalist in Yogyakarta Documentary Film Festival 2016. Now, he focused on documentary filmmaking about mythology and environment in Java, Indonesia. A 24-year-old young boy breaks up with his girlfriend. That night, he meets a mysterious older woman, Ah May. Ah May’s resemblance to his mother piques his interest and encourages him to approach her. Director: Jacky Yeap born at Taiping, a small town which looks like Paris, it is a peace, quiet, and slow rhythm place. Jacky moved to Sarawak to pursue his degree. In year 2015, he graduated from University Malaysia Sarawak with major in film making. When he was young, he love to watch Malaysian Drama because he felt that the environment shown in the Drama make it look “very Malaysia”. Then, he decided to visual method to capture “Malaysia” and share it with peoples around the world. Jacky has produced 4 short films, and all of them had one similarity, that is a shot showing [I Love You Lau Shu Lin] is appeared in all the films. He said, all his films must show this shot until the girl see the film. A girl who got pregnant accidentally with her broke up boyfriend.She felt guilty to having this life in her body.This is a story about a girl accept and forced to give up a new life in her body. Director: Won Jun Yap is a new student director who study Drama & Visual in New Era College with passion. #SeaShorts: Check out the complete programme list and Festival Schedule! I started making short films after watching Amir Muhammad’s “6 Shorts”. The compilations of 6 short films have something so playful and reflective, it gave me an itch to grab a camera and do something. And each time I saw a short film by a fellow filmmakers, people nearby, like Royston Tan from Singapore, Edwin from Indonesia and Aditya Assarat from Thailand, it makes me want to make film. I have a shock when I first saw Edwin’s A Very Slow Breakfast in 2004, I realised there are so many things I still had not tried before! But again and again, we are seeing proofs that cinema is still alive and living well, and kicking strong. Especially short films. It is especially short films that show us cinema is still young and curious. I will say short film has the spirit of the beginning of cinema. Short films is something to be celebrated. I remember the first ever short film festival I attended, I was 27, year 2005. My short film A Tree in Tanjung Malim was in competition. I went to a small German town all by myself. It was the legendary Oberhausen Short Film Festival. I heard Wim Wenders smoked his first cigarette here, he was 17. Maybe not 17, or maybe not Wim Wender, but another well known German filmmaker. Nevertheless, it is a way to tell people that Oberhausen is the world oldest short film festival. And famous filmmakers got inspired here when they were teenager. That always impressed people. I had already been to a few international film festival before that, most important one was Rotterdam International Film Festival. In Rotterdam, there were so many cinemas showing so many films with so many audiences. I was overwhelmed. Oberhausen was very different. All the films was just shown in this one single building. And there are showing only short films. And when I realized some of them just making a living by making short films, it opens up a door for me, and I took a good look inside. It was a very important experience for me. I made a life changing decision. No, it was not picking up my first cigarette. I decided to quit my job and become a full time filmmaker. That was what happened when I visited a short film festival for the first time. I don’t know what will happen from you coming to this film festival. What are you going to experience here? We are showing you more than 100 short films, from cinema auteur like Tsai Ming Liang, Lav Diaz, Aditya Assarat, John Torress, and new auteur like Davy Chou, up and coming filmmakers like Kavich Neang, Rina Tsou, to filmmakers that are still studying in the school, like Chloe Yap. You will have a chance to meet the filmmakers, the curators, the juries, and have passionate discussion about films. If you are crazy, you can take the challenge to watch 100 short films in SeaShorts. where you will be locked up in a room and we will give you food and drinks during short breaks. Yes, you can watch all 100 short films in 3 days.